Coming into the light, I saw that the creature at their lead was trailing a long black cape, festooned with brasses, rosettes and ribbons and topped with a large horse’s skull, which was in turn connected to a wooden cane. As the cloaked figure drew closer, its head dropped down and hovered over me. I watched, stunned, as the jaw of the skull suddenly slackened and its mouth fell open. Staring up at this, I heard the sudden snap of a joist or spring, and its jaw locked around the brim of my hat - pulling it clean from my head. This all relates to a curious tradition, still practiced in the east Kent area, called ‘Hoodening’. Traditionally ‘the horse’ and a group of other characters - including a washerwoman and assorted jockeys - would act out scenes at the homes of wealthy locals in return for money and booze. It is also supposedly from the Hoodening tradition that the term ‘horse-play’, meaning ‘rough and boisterous behaviour’ (so beloved of 1980's primary school teachers), is derived. The practice of Hoodening is thought to come from the Pagan Scandinavians, who, in the hope of success in battle, often sacrificed a horse to Odin at the winter solstice. ‘Hoodening’ may even be a corruption of ‘Odining’. Modern Hoodening - which still takes place in Kent - is a considerably watered-down version of the earlier tradition. 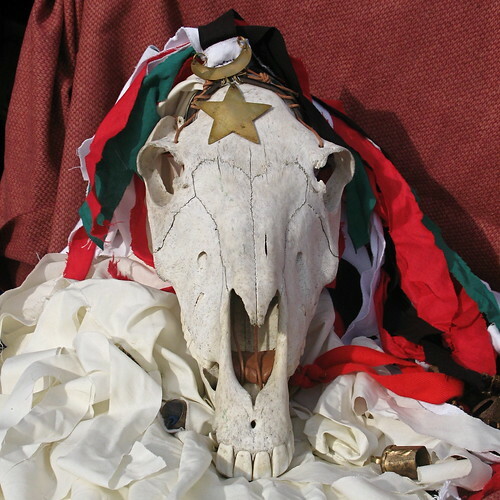 Now involving Morris dancing, the horse’s skull has also been replaced with a decidedly less-scary wooden one.